The weather in Wester Ross and Sutherland is an entirely unpredictable affair. A glance at the Climbline five-day forecast pinned up outside the outdoor shop in Ullapool suggested three days of clear spells and scattered showers. Things looked good as I set off up An Teallach on day one - warm, clear and dry. However, half way up, the Atlantic clouds rolled in and the first specks of precipitation saw the Berghaus Paclite hauled unceremoniously from its snug home in the bottom of my rucksack. By the time the first summit was reached, I was in a complete white-out, cold, heavy drops of rain lashing the Gore-Tex. A hasty retreat was made. Day two, however, was a complete contrast. I poked my head out of the tent shortly after 8am to find a cloudless sky, hot rays of sun beating down on sleep-ruffled hair. A short car journey north took me to Inchnadamph and a small car park helpfully provided for hillwalkers near the hotel. My destination: the two highest peaks in Assynt - Conival (3238ft) and Ben More Assynt (3274ft). Boots on, I set off north along the road, crossing the River Traligill, and then took the first right on to a track leading east past the neat white frontage of the Assynt Field Centre. The way passes through a high kissing gate beyond a small cluster of cottages and here there's a useful information board, provided by Scottish Natural Heritage, outlining the area's flora and fauna. The track continues east, following the river upstream to a concrete bridge where the water is crossed. Staying on the track, I following a sign for Glenbain, and half a mile on reached this neat little holiday cottage, perched part way up the glen. Carry on up the track and the craggy bulk of Conival is in full view ahead. As a tin hut is neared, the route narrows into a comfortable grassy path, rising left to cross the Allt Poll an Droighinn just before a small plantation of pine trees. The way forks here. The right hand option crosses a small bridge and leads up to a set of caves popular with potholers. Having packed a torch, I made a mental note to stop off for a look on the way back. My mind now, however, was on the ascent and I stayed on the north side of the burn. The way skirts the southern edge of the woodland and follows a narrow path up Glenn Dubh. The way is easy to navigate and the underfoot terrain is generally solid, but can be muddy in places. The path stays with the stream for the next mile and a half, rising gently, before curving left to climb steeply out of the gully and over open hillside. The burn remains your faithful companion and, as you gain height, there are a series of impressive little waterfalls to take your mind off the unrelenting climb as it snatches at leg muscles with every step. Eventually an auditorium of steep cliffs greets you, but the ascent is by no means over. The path skirts right to cross the burn then rises through the crags. A little easy scrambling is required here, but there is nothing too taxing. At the top, the path continues to rise into the bealach, swapping the grassy lands experienced thus far for rocky scree and a generous scattering of sharp quartzite boulders. An occasional glance over the shoulder reveals views down to Loch Assynt. The path zig-zags up on to the northern shoulder of Conival where an outlying top is reached. From here, the ridge runs south, fairly level, to the summit itself, a stone shelter and cairn marking the top. On a clear day, there are spectacular views in all directions, the most obvious landmarks Quinag to the north and Canisp to the south west. 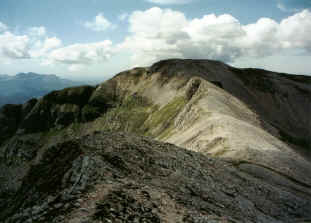 Neighbouring Ben More Assynt sits to the east, along a long, broad scree-strewn ridge. 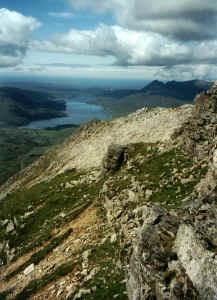 The path descends east from Conival, dropping sharply over a jumble of boulders and blocks. There's nothing difficult, but take care of ankles here. Large rocks give way to lighter scree below as the ridge rises and falls over a couple of tops before finally climbing on to Ben More Assynt. There are a couple of candidates for summit - two piles of rock topped with cairns. The high point is the more northerly of the pair. Again, great views are the order of the day and on a clear day you should just be able to make out the North Sea in the east. The Atlantic Ocean to the west is nearer and much more obvious. One suggested option from here is to descend over the south ridge of Ben More Assynt - narrow and exposed in places - to Dubh Loch Mor in the coire below. From there, it's possible to head up into the col between Conival and Breabag and return home from there. However, the terrain is rough, boggy, pitted with small pools and a haven for midges, so I decided to take the less adventurous option of heading back along the ridge towards Conival. It's possible to cut out the summit by leaving the ridge at its lowest point and skirting right to the small lochan immediately below Conival. A short pull over scree brings you out at the path just above the bealach. Descend from here into Gleann Dubh, retracing steps to the junction of paths where a short detour can be made to the caves. The underlying rock is Durness limestone and, beneath the ground, chambers and tunnels have been carved out by the streams over the centuries. There are three caves and these can be explored with care, provided you've brought a torch. At one point, the River Traligill disappears completely beneath a limestone cliff, re-emerging lower down. Start/parking Free car park on A894 below Inchnadamph Hotel. GR: 252216. Donations can be made here to local mountain rescue team. Grading A strenuous ascent over rough ground, although there are paths throughout.